← Stan Freberg. Cue the Cherry. July 10, 2015 – Jimmy Carter, now in his 91st year, has been out of office longer than any millennial has been alive. That makes him extraneous to the majority of living Americans, and even those who remember his presidency dismiss him as a fleeting peculiarity between Watergate and Reagan. Yet those of us with long memories suspect Carter’s political setbacks were not only due to factors beyond his control but exacerbated by a press that didn’t always get the story right. Lost in the narrative is the image of Carter as an assertive leader who championed civil rights, pressed for human rights around the world, sought international peace, and always tried to do the right thing. It was that latter trait, some say, that did him in, not only in the press but also in the darker passages of government. There is a dubious conspiracy theory that the CIA and its media cohorts worked hard to damage Carter’s reputation and assure his defeat in the 1980 election. The theory is interesting but doesn’t give due credit to Ronald Reagan, the best presidential campaigner since Franklin Roosevelt. There are many reasons Carter lost the election of 1980 (including the one cited by George McGovern to explain his disastrous defeat in 1972: “Lack of votes”). 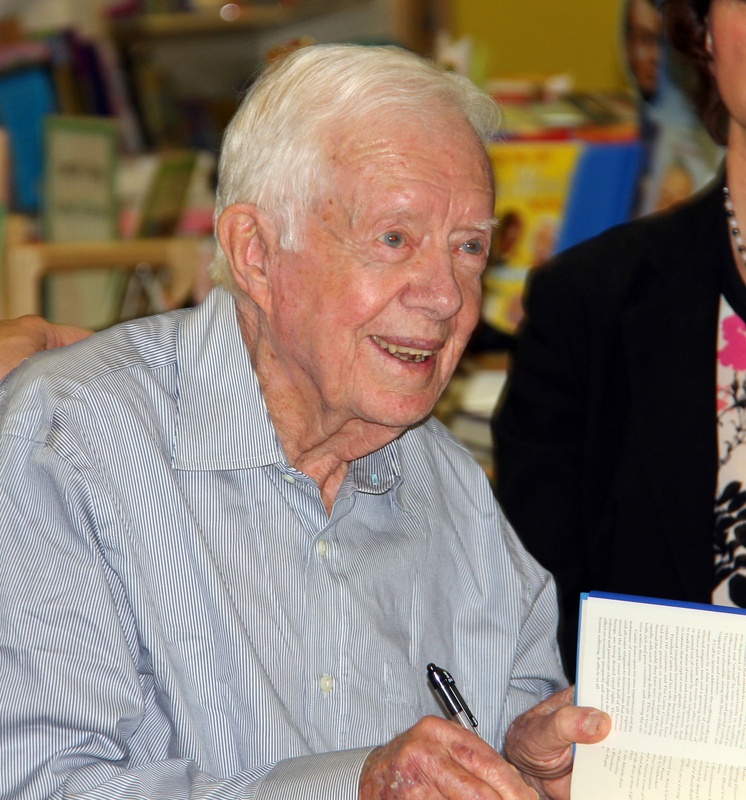 But it is good to see Carter’s reputation slowly restored by journalists and historians, including Kristof and Randall Balmer, whose astute Redeemer, the Life of Jimmy Carter, places Carter in the venerable American tradition of progressive evangelicalism. It is that tradition, in fact, that first attracted me to Jimmy Carter. When he moved into the White House he became the world’s most famous Baptist. Naturally, ambitious Baptist bureaucrats scrambled to meet him so they could drop his name. I admit I was among those Baptists who thought it would be great to meet him. At it turned out, my first encounter was a bit of a misadventure. In 1977 I was 32 years old and editor of The American Baptist magazine, the official organ of American Baptist Churches in the USA. The magazine itself founded in 1803 and billing itself as “the oldest religious periodical with continuous publication in the western hemisphere,” had gravitas. I had no such thing, and I was eager to be seen engaging the president of the United States in Baptist small talk. That year President Carter signed treaties to turn the Panama Canal over to Panama. Barry Goldwater and Ronald Reagan called upon the Senate to reject the treaties, but John Wayne was for them, and Carter should have known that the Duke trumps a Goldwater and Reagan in any game. But he launched a public relations campaign to win popular support for the treaties, and he invited many maxi- and mini-molders of public opinion to the White House to make his case. Among the molders were religious journalists who went to the White House to hear the president make his case. A couple hundred journalists came from every religious tradition, and we shuffled respectfully into the East Room of the White House where rows of folding chairs had been placed. I had never been to the White House and I prepared carefully for the occasion. I bought a new tan suit and new earth shoes that not only squeaked on the shiny floor but also had unusually low heels that kept me off balance. I carried in my side pocket a copy of Input, the newsletter for American Baptist professional leaders, which published a statement of American Baptist support for the treaties. I wanted to give the statement to the president so I shrewdly sat a few chairs from Jim Wall, editor of The Christian Century. Jim, a Georgian, was known to be a friend of Carter’s and I calculated the president would probably notice him in the chairs. At the appointed hour, a shrill voice called out, “Ladies and Gentlemen the president of the United States.” We stood, and Jimmy Carter strode purposefully into the room. He was dressed in a light-gray plaid double knit suit and he flashed his familiar smile as he headed for the podium. Ambassador Ellsworth Bunker, who was charged with giving the treaties diplomatic heft, and National Security Advisor Zbigniew Brzezinski, flanked him. Bunker, tall and glum, and Brzezinski, with his trademark cowlick, seemed resigned and weary, as if their silent support had been required for more than one presidential briefing. Carter spoke briefly on the moral obligation and legal logic of the treaties, and stepped away from the podium. The crowd stood at once and we began pressing toward the president, hoping to catch his eye. Jimmy Carter is warm and nearly charismatic when he is pressing the flesh, an attribute never captured on television. He grabbed hands and spoke easily to African American pastors, lavishly dressed bishops, bearded rabbis in black suits, and Baptist editors in white belts and double knit pants. I heard Carter say, “Hi, Jim,” to Wall as I squeezed among the clerics. I worked my way behind the president’s back as he shook hands with a purple-vested bishop and I reached into my pocket for the copy of Input. Behind me was my friend William Dudde, a Lutheran writer, and behind Bill was an unknown admirer pushing eagerly forward. The admirer thrust himself against Bill, who lost his balance and pushed heavily against me. I lost my footing in my new earth shoes and fell rudely against the president’s back. I smelled his soap and hairspray. Both Carter and the Secret Service must have been inured to unplanned jostling in crowds, so I was not – as I briefly expected – wrestled to the ground by security agents. Instead, Carter turned and scowled at me with his clear blue eyes, the “fishy-eyed stare” he reportedly gave to people who annoyed him. He smiled slightly and took my hand. Weeks later, the White House sent a wide-angle black and white photograph to all the participants. It shows President Carter smiling in the midst of the crowd. I am standing a few steps behind Carter, also smiling and probably rehearsing a speech I wanted to give the president about Baptist support for the treaties. Providentially, the picture was taken before I could get any closer. I lost it years ago, and it’s just as well. Happily, I had several more brief encounters with Jimmy Carter over the years which ended without mishap. Each time I was impressed by his graciousness and easy manner. He is never an intimidating presence, despite his international fame and the awesome power he once held. I once attended a meeting on health care sponsored by the Carter Center and was filling my plate at a buffet offering fruit, veggies, and granola. “Statistics show the Mormons live the longest because they don’t use caffeine and eat healthy food like this,” said someone standing just outside my line of sight. I turned and recognized the former president, also filling his plate. Jimmy Carter is now 90, and I hope he lives long enough to see more pundits and journalists acknowledge the wisdom, courage, and strength he brought to the White House and in all the years before and after his presidency. That alone should qualify him for a statue somewhere. And I would like to think more than one candidate in the forthcoming election might honor the model offered by the much-disparaged 39th president of the United States. But I think it’s more likely that the candidates will adopt more cynical approaches to their pursuit of power, and historians will note that the president who always tried to do the right thing remains unique in his time and, sadly, in all time. Good piece on Jimmy Carter. May he live forever, at least in our hearts and minds. He was also an honest man who told it like it is. A good friend whom I admired for his liberal spirit surprised me when I was speaking well of Jimmy with a whispered “We (his wife and he) don’t like Jimmy very much.” That seemed out of character but then I realized it was Jimmy’s candor in reference to the Middle East they didn’t like. My now-departed friends were Jewish. If and when Jimmy joins them they may get a different perspective on the man who was proud that there had been no war on his watch and no American lives lost in combat.